Basically, starting a business and sustaining is a challenge to many entrepreneurs. In most instances, promoting a business can also be a big hurdle particularly when one is new in the industry. Keep it simple offers a solution to such individuals who need to promote their online businesses and move up the ladder. This book is an online guide written by Charlene Brown. The book is intended to help beginners in online businesses to cultivate strong brands that have been used by high level performers in e-businesses. 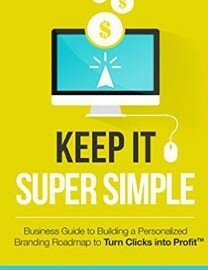 The book offers the best strategies to promote brands quickly at minimum costs. Chapter one of ‘keep it simple’ provides a guide on the applicability of the book and how it should be used. Charlene Brown claims that this book is not for the average entrepreneurs who are comfortable with the current conditions of their businesses. Rather, the book is intended to target e-business owners whose businesses are in the initial stages of growth. The book provides insights to such entrepreneurs on how to develop their own strategies to fit onto their own business needs. Charlene highlights the secret to a successful business as determination, dream, passion and consistency. He claims that successful people dictate their own dreams and business actions and do not allow failure to weigh them down. The author highlights investment as an important strategy to succeed in an e-business. Successful entrepreneurs are obliged to invest both time and financial resources to enhance their brand. This chapter provides a guide on the important aspects an e-business entrepreneur should learn about branding. The author claims that micro-business owners fail to appreciate the importance of branding in their businesses. In fact, they focus on putting their businesses into action but they neglect the value associated with financing their branding. He advises micro-business owners to consider branding as a vital aspect in building reputation for their businesses. Reputation of a business expresses the uniqueness of a business and its positive influence to the business audience and the community. This chapter commences by criticizing those entrepreneurs who attempts to apply the strategies of large brands in the world in order to reflect the same fame to their businesses. Charlene claims that brands are different and unique to each business. Within the chapter, his primary focus is to small businesses that need to develop their own road map in order to attain financial success. The author outlines flexibility to be an important feature to be embraced for effective branding. Charlene also outlines the importance of investing in oneself and in brand, planning accordingly and timing in ensuring the e-businesses are successful. This chapter begins with a quote by Ramit Sethi who stated that individuals are excited by the outcomes of others without comprehending the actions that happen behind the scenes. The author compares the Ramit Sethi quote to brands. Charlene postulates that individuals are excited about the results of successful businesses yet they fail to recognize the efforts, hard work and time invested to see such enterprises on the top. The author recognizes the fact that many online businesses fail because they lack guidance on how to apply the right techniques. Various techniques discussed to build a roadmap to an enterprise success within the chapter are proper planning and brand envy. The author compares a misguidance on positive outcomes to ice-bergs. He outlines hard work to be the best ingredient of success and advices businesses to embrace it. An e-business owner needs to determine what’s best for his or her business and needs to develop a brand that will stand the test of time. A small e-business owner needs not to mimic the techniques and strategies of big businesses. Rather, they need to discover their own needs and identify their own path. Although it is important to use other companies as a case study, mimicking them is a plan to fail. Charlene advises businesses define their own brands so as to be successful in their ventures. According to Charlene, defining the brand involves outlining the mission and vision of a business. An important aspect in defining the brand is to understand the target audience. Towards the end of the chapter, the author outlines six strategies to boost the branding stamina. This chapter points out that a successful branding is a gradual process and it does not happen instantly. The author notes that lots of efforts are required in order to have successful brands. Key aspect to note is that brands are empowered by the audience. Therefore, to build a successful brand, it is important to identify the high-quality customers of the business. It may also be crucial to seek outsourced assistance in order to boost the brand. This chapter outlines various strategies to be used in order to boost the performance of a brand. The author provides five strategies that can be used to enhance the performance. The importance of constant assessments of the brand has been highlighted as it facilitates in identifying aspects that need to be revitalized. This chapter provides guidelines on how to cultivate the brand awareness. Charlene outlines the importance of keeping the authors engaged so as to build an online notability for the business. The audience is kept engaged through the content that is made available to them via the online sites. Content shared needs to be relevant to the audience. In the chapter, the author outlines common ways that can inhibit connection to the audience. The chapter highlights the importance of social connections over the internet in order to draw more clients to the business website. The author notes that a business owner realizes that they are attaining a purposeful attention when individuals flood in the website seeking for services. The author gives advice to business owners to utilize their social networks in enhancing their brands. The chapter highlights the importance of hiring professionals to manage social manager. The author notes that individuals need to make use of professionals to avoid making major mistakes which are very expensive to fix. The author also provides three aspects to consider when preparing to hire social managers. The aspects highlighted are when to hire, where to find them and who to hire. In the chapter, the author outlines the challenges that come along with outsourcing fables in branding. Fables are indifferences that business owners have with regards to outsourcing. He points out that allowing outsourcing fables may cause a business owner to miss out on excellent opportunities in maximizing time on the brand. Charlene proposes to entrepreneurs to have a reasonable budget in place so as to tackle the branding roadmap. This is the last chapter of the book and it focuses on reflecting about the branding journey and how to proceed to the next journey. The author highlights the importance of re-evaluating the executed plan on branding. The village is also highlighted as the ultimate unit of support for a successful branding. The author finalizes the book by highlighting the importance of investing in terms of ideas, time and devotion in branding.